Ms. Greenhalgh says she was not able to answer the Mother's Day appeal but does have a box of donated and purchased items to send. She hopes that money will be plentiful so that everyone who asks can be taken in. 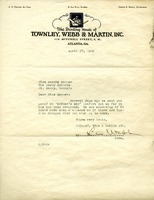 The printing house of Townley, Webb, and Martin, Inc asks Miss Bonner about the location of the Mother's Day proof they had previously sent for review. Mrs. Wm. 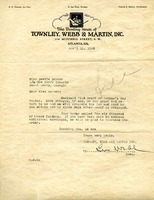 Thaw Jr. sends $500. Wm. 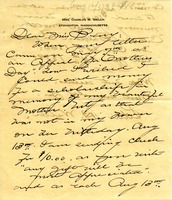 W. Stewart donates $150 in memory of Elizabeth A. Stewart. 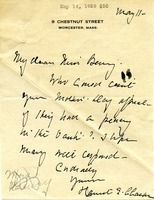 Clarke sends a donation in response to the Mother's Day appeal. 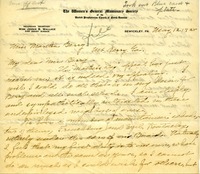 Martha Berry sends her heartfelt thanks for Mrs Alcott's gift that came at a perfect time because they are having trouble taking care of the summer students, and she writes about the eighty boys and girls recently graduated that are equipped to become useful citizens. 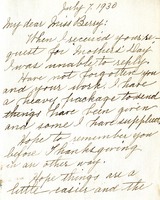 Welch writes to Berry about her appeal for Mother's Day. She wishes to donate $10 each year on her mother's birthday, August 13th, to honor her mother. 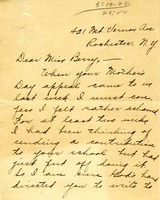 Miss Wallace says she received the "Mother's Day" appeal and informs Miss Berry that she has received several other appeals from similar "mountaineer" schools. Consequently, she is short on funds and will not be able to give at the present time. 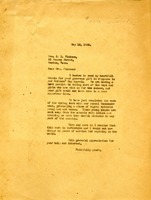 Thank you letter to D. L. Pinkman for his donation as a result of the Mothers' Day appeal. It notes that there were 80 graduates that year.